I found this band from the Bremerton/Tacoma area of Washington state on CD Baby one night while searching for some new music and, so far, it has been the best discovery I have made in 2017 – they are excellent! You can download a copy of their last album, 3016’s Penny for Your Thoughts – or indeed four other albums in their catalogue – for free from CDBaby.com, and I encourage you to do so. How many bands do that? Not many, that’s for sure. Penny for Your Thoughts is spectacular, from the opening lady asking the album title as a flirtatious question, right down to the spinning penny at the end. Their music is a good mix of heavy metal and powerful prog and you will hear early comparisons to Dream Theater, lead singer Sean Thompson having a great range, from James La Brie to Roland Orzabal of Tears For Fears. One of the keys to Odd Logic’s music is their ability to change direction and pace so quickly within a song. I know some will probably look at this as a fault, but for me it keeps the music interesting. Although I love lengthy epics, frequently breaking them up with fast paced or quiet interludes is what it takes to hold the listeners’ attention. Think of your favorites…mine is Genesis’ Supper’s Ready. What would that song be without interesting breaks like Willow Farm or Apocalypse in 9/8? Odd Logic never lets you get bored with unending rewinds of riffs or endless spirals and loops. It never gets dull, the instrumentation matching a prolific band with a multitude of stories to tell, and having produced seven albums since 2003 they are worth every chord and lyric. Odd Logic, like Rush, are a three-piece band, and they produce about as much power. Their story began in 2003 after singer/guitarist/keyboardist Sean Thompson’s band MINE! disbanded after releasing one independent album, Powerlines, and touring locally in the Washington area opening for the likes of Sting, Journey, and John Waite. Odd Logic was formed as an outlet for Sean’s true passion of more progressive, hard-edged rock. The demo Parallax Panorama (2004) featured a guest percussionist and bassist, who were in reality Sean’s alter egos as he performed all of the instruments and vocals. Later releases include Legends of Monta, Part I (2006) and Part II (2009), the Sync-To-Movie adventure Over the Underworld (2011), and the fantasy live record, featuring a full production of cast members and brand new music called If We Were Live (2013). Recent albums have included guest appearances from local musicians, including Kevin Hunter who contributed all keyboards and piano on If We Were Live. The title track sets the stage and tone for the rest of the album well, an over 17-minute epic powerhouse, full of expressive vocals, deep bass, hammering drums, and lightning-bolt lead guitars. There are plenty of those mood, melody, and timing shifts which are the band’s trademark in an awesome spectacle of music that would just sound perfect live. Yes, I am making plans to see this band on stage. This track also includes some cool Mellotron and organ mixed in. Master of the Moor is the perfect thematic presence to tell a rich story of historic grandeur. A marauder coming to pillage; you can almost see this character walking out of the thick fog engulfing rugged moorland…hiding from the world. “On the run from the emperor’s hand, I’ve been running too long. I’ve been coming here for centuries but now I’m a wanted man. Because you saw my face, in the darkened sky. Now you wonder why, I return home…”. Excellent organ and keyboard sounds mix well with the dynamic drums, bass and electric guitar. Witch Runner also opens well with solid vocals and softer melodic tones with more emotional lyrics; “Safe in darkness, lost in silence. Just another girl in a land we cannot see. 10 years the light surrounds you, and we ask you to help us believe. Iron Skyline is another epic prog tale with an over ten-minute reign. Power drums, heavy bass and electric guitar get this off to a start, Sean’s vocals excellent as he sings, “We reach above the iron skyline. We reach above the iron throne. Untie the sun beyond the unseen light. Break through the armored skyline”, echoing some of the album’s main themes. Memories of Light opens with softly strummed acoustic guitar and Spanish lyrics, “Alumbra ya, cuando llegara. Cuando llegara el sol!”, then Thompson’s vocals return, “No help from the moon, hard to believe it’s true. One man shields the light, he changed all our lives. Still we are blind without the light. Getting what we want is only in the sky”. The choruses on all their albums are so well written and memorable. 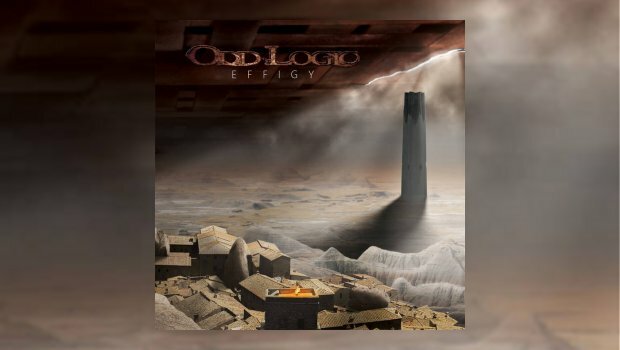 More cool organ and Mellotron interplay with the drums, bass, and guitar solos makes for another of Effigy‘s best songs. This is already one of my favorite albums of 2017 and the band could be my favorite of the year too. Go back through their catalog and listen to the magic they have created for over 14 years. Prolific, with long epic tracks, great vocals and expert musicianship. This band deserves to be recognized.